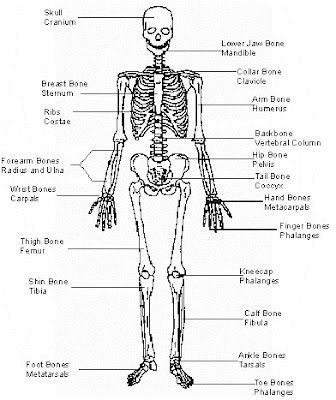 Framework of human limbs are on hands and feet. 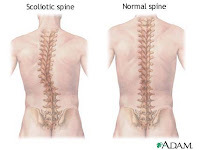 Scoliosis is a condition that causes the spine to curve either away from the middle or sideways, making it look like an “S” or a “C” rather than a straight line. Tap root systemThe first root produced from a seed is called the radicle. In many dicotyledonous plants this root greatly enlarges to become the most prominent root of the plant and is known as a tap root. Many smaller branch roots may grow from the tap root. In monocotyledonous plants, the radicle is short lived and is replaced by numerous roots of more or less equal size. These roots are adventitious which means they can grow from plant organs other than roots e.g. stems. Flowering plants are often divided into two major groups - dicotyledonous and monocotyledonous plants. Although these two groups are no longer considered valid by taxonomists, they are useful for gaining a general understanding of how plants function. 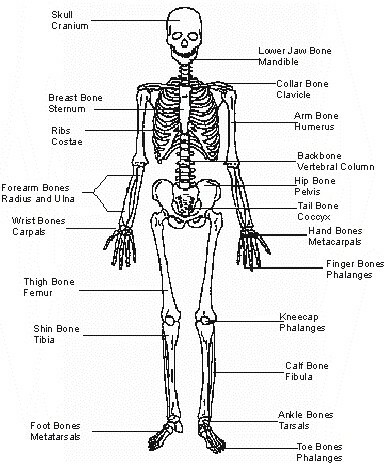 Below are the general characteristics of the two groups, note that there are exceptions to all these characteristics. Support : The stems support the leaves in a position where they can absorb sufficient sunlight for photosynthesis. In young plants, the stem turgour pressure gives support to the young plant. Food production : In many plants the stems (mainly young shoots, but even the branches and trunk in some cases) contain chlorophyll and are thus able to photosynthesise and produce organic molecules for the plant. In some plants such as cacti, the entire plant's photosynthetic area is comprised of stem and they have no true leaves. Storage : Stems are important storage organs for the plant. They may store vast amounts of water as well as starch for the plant to use at other times e.g. cacti. Transport : Stems contain vascular tissue which transports water and dissolved nutrients from the roots to the leaves. The two main transport tissues in a vascular bundle are phloem and xylem and between these is a very important layer of cells, the cambium, which is able to divide. The xylem differentiates from the part of the vascular bundle nearest the centre of the stem and then progressively towards the cambium in the middle of the bundle. Protoxylem is the xylem which differentiates first and may consist of a different combination of xylem cells when compared to the metaxylem which differentiates later and lies closer to the cambium. The xylem is responsible for transporting water and dissolved nutrients. The phloem starts differentiating on the side of the vascular bundle orientated towards the outside of the stem and then progressively towards the middle, towards the cambium in the middle of the bundle. As in the xylem, the phloem which first differentiated is known as the protophloem and the metaphloem is the later phloem. The protophloem is often associated with schlerenchyma fibres - the phloem fibres. The phloem transports organic substances through the stem. Between the xylem and the phloem lies an important layer of cells, the cambium, which are still able to divide i.e. they are meristematic. 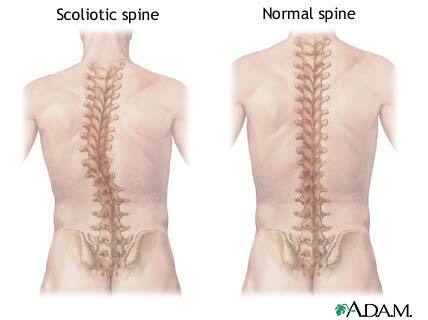 The cambium which lies inside the vascular bundles is called the fascicular cambium. The fascicular cambium consists of vascular bundles which are united by sections of parenchyma cells. These parenchyma cells also become meristematic, and so form the interfascicular cambium. The fascicular and interfascicular cambium form a continuous cylindrical layer inside the stem. The cells divide to form new xylem cells towards the inside of the stem and new phloem toward the outside of the stem by a process called secondary thickening which involves the formation of wood. 1. They are where the tree produces organic molecules by a complex array of chemical pathways including the most well known: photosynthesis. 2. They are important to the water balance of the tree. Water not used by the metabolism of the tree passes out through the leaves (through special openings called stomata) by a process called transpiration. The leaves of the trees come in many different shapes and sizes. Their internal anatomy usually has ground tissue which contains chloroplasts. Chlorophyll, the light harvesting pigment of photosynthesis is green in colour and occurs inside the chloroplasts giving the leaves their green appearance. 1. light absorption by chlorophyll during photosynthesis. 2. the absorption of carbon dioxide (CO2) for the production of organic molecules. The tree's leaves are thin and none of its cells are far away from the surface. This is important for diffusion of gases (carbon dioxide, oxygen and water vapour) between the cells of the leaf and the atmosphere. The blade is thin and expanded and is supported by a network of veins while the petiole is slender and connects the leaf to the stem. The leaf blade has two types of configuration. It may be in one unit, in which case the leaf is called a simple leaf, or it may be divided into numerous small parts that look like individual leaves and which form a compound leaf. It may be difficult to tell whether one is looking at a simple leaf or the leaflet (pinna) of a compound leaf. The distinction can be made by the fact that a leaf (simple or compound) has an axial bud between the petiole and the stem. The petiole of a leaf may vary considerably and can be long, short, rounded or flat. Some leaves have no petioles in which case they are said to be sessile. At the base of the petiole in many leaves are small leaf-like structures called stipules e.g. in peas, beans and roses. Between the petiole and the stem is a bud of a potential branch (an axial bud). Leaves may be arranged on the stem in a variety of ways. The place on the stem from where the leaves grow is called a node and the part between the nodes is the internode. If only one leaf arises at a node the leaves are said to be alternate, if there are two leaves they are opposite and if there are more than two they are whorled. Some plants and trees are monocotyledonous e.g. bamboo, bananas and palms. The leaves of these plants do not have petioles like typical dicotyledonous leaves. Instead, their leaves consist of a sheath and a blade. The sheath is often nearly as large as the blade and completely surrounds the stem, sometimes extending over the length of the internode. The leaf blade is characterised by parallel venation . It is often necessary to examine the blade carefully to see that the veins are indeed parallel. Take a look at the leaves of bamboowhich is related to grass, both being members of the same plant family, the Poaceae. Some monocotyledonous plants possess the largest leaves in the plant kingdom. Trees belonging to the Palm family (the Aracaceae) have very large leaves and the Raffia palm (genus Raphia) has the largest leaves of all, which can attain a length of 18m. Other examples of large leaves are found in the Musaceae, the banana family, and the Strelitziaceae, the bird-of-paradise flower family. Receptacle Part of flower stalk bearing the floral organs, at base of flower. Sepal Leaf-like structures at flower base, protects young flower bud. Calyx All the sepals together form the calyx. Petal Located in and above the sepals, often large and colourful, sometimes scented, sometimes producing nectar. Often serve to attract pollinators to the plant. Corolla All the petals together form the corolla. Stamen Male part of the flower, consisting of the anther and filament, makes pollen grains. Filament The stalk of the stamen which bears the anther. Anther The pollen bearing portion of a stamen. Pollen Grains containing the male gametes. Immature male gametophyte with a protective outer covering. Carpel\Pistil Female part of the flower. Consisting of the stigma, style and ovary. Stigma Often sticky top of carpel, serves as a receptive surface for pollen grains. 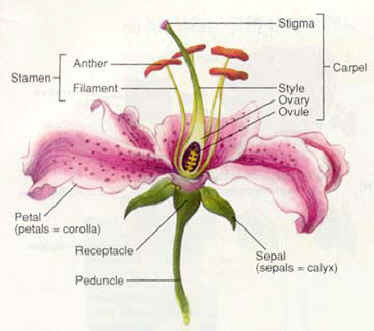 Style The stalk of a carpel, between the stigma and the ovary, through which the pollen tube grows. Ovary Enlarged base of the carpel containing the ovule or ovules. The ovary matures to become a fruit. Ovule Located in the ovaries. Carries female gametes. Ovules become seeds on fertilization. a. Herbivore : A plant-eating animal. b. Carnivore: A meat-eating animal. c. Omnivore: An animal which eats both plants and other animals. 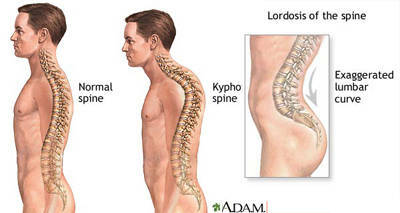 their bodies go through a complete change, known as complete metamorphosis. • First, the adults lay eggs on leaves. to turn into a pupa. The pupa of a butterfly is often called a chrysalis. 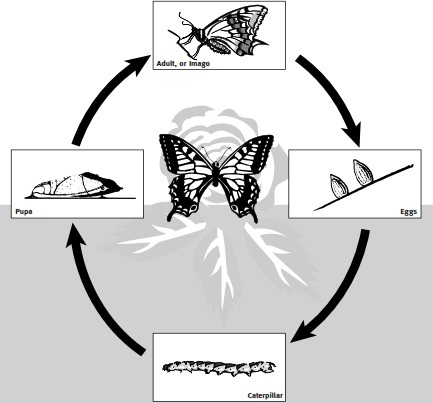 • The body of the butterfly then develops inside the pupa. • When at last an adult butterfly emerges, it flies off to look for a mate, and the cycle starts all over again. 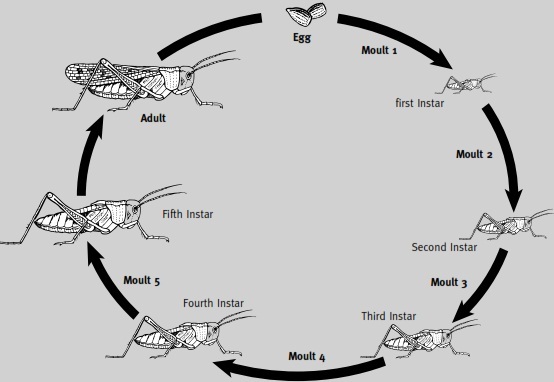 Locusts develop their adult form gradually, without any sudden change in body shape. This is called incomplete metamorphosis. Locusts lay eggs in damp, warm soil or sand. After around 10 days young locusts, called nymphs, emerge. These nymphs have large heads. They do not have wings, only wing buds but otherwise they look like smaller versions of the adult. 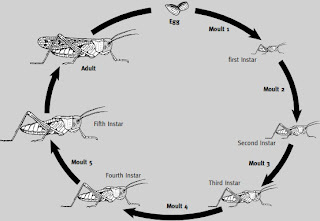 As the nymphs grow, they shed their skins or moult. After the fifth moult they are mature adults with fully formed wings and sexual organs. Symbiosis is a close relationship between two living things, divided into three main categories; Mutualism, Commensalism, and Parasitism. Mutualism, when both species involved benefit from the relationship. For example, the symbiosis between a buffalo with starlings. Buffaloes gain with endless ticks on her, while starlings feel lucky because getting food such as fleas. Another example is the relationship between butterflies or bees with flowering plants. Butterflies and bees need nectar found in flowers as food. Flowers need butterfly or bee to help the process of pollination. Commensalism, when one species benefits and the other isn’t affected. For example, the symbiosis between the shark with remora fish. Remora fish which swim near the shark's body will contribute to roam wherever the shark was gone. Remora fish to be safe from the threat of other predatory fish because fish prey afraid of sharks. As for the shark, remora fish presence or absence does not affect him. Another example is Commensalism symbiotic relationship between ferns or orchids with large trees and sea anemones with clown fish. Parasitism, when one species benefits, and the other is harmed in the process. For example, the relationship between the parasites of citrus, flowers raflesia with its host, and the flea with the animals where he lived. Parasite feel lucky because getting food from citrus, citrus while impaired due to food taken by the parasite. Raflesia sucking food made their host plants. Consequently, raflesia can flourish, while their host plants over time will die. Lice obtain food by sucking the blood of its host animal's body, while the animals were seized in the skin feel itchy and unhealthy growth. A food chain indicates what feeds on what, it also shows how energy flows from one living thing to another. A chain will always start with a plant (a primary producer). • Green plants get their energy from the sun. They can change light energy into chemical energy in food. They are known as the primary producers. • Animals which eat only plants are called herbivores. • Animals which eat only meat are called carnivores. • Some animals eat both meat and plants. They are called omnivores. In the food chain, bacterial and fungal spoilage served as decomposers.